Kenneth Bae In A North Korean Work Prison Camp Changed His Prayer From "Send me home, Lord" to "Use me." 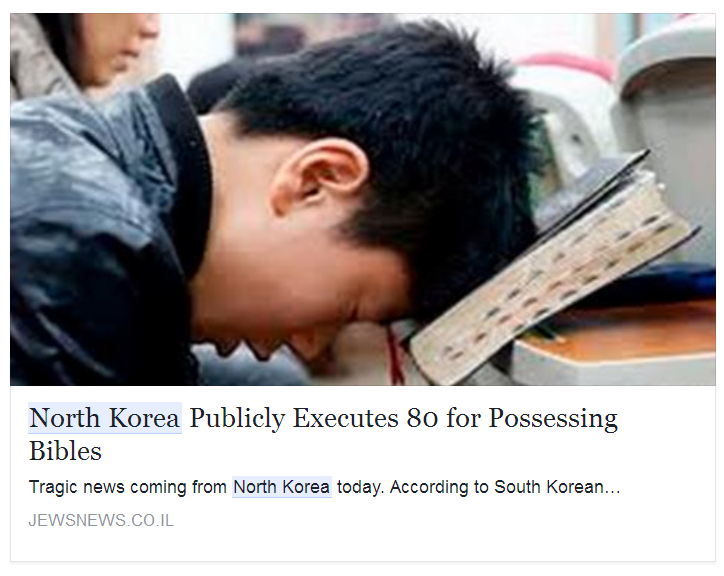 Believers in North Korea who choose to share the gospel of Yeshua Jesus pay a high price. If you are a caught as a Christian spreading the gospel, you and your entire family can be sent to a prison camp and never let out. Would you share the gospel if it cost you life in prison? The Voice of the Martyrs is one of those organizations which is boldly sharing the gospel for those who love in North Korea. 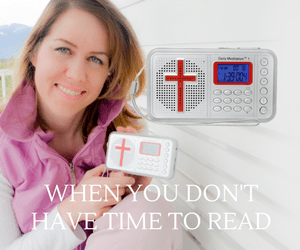 In this article,VOM has said to have collected large amounts of fax numbers inside North Korea, where they send weekly faxes containing Christian messages and Scripture passages on love to each of the fax numbers. An anonymous fax sent from the North Korean embassy for Finland promises workers affiliated with The Voice of the Martyrs that “something very bad will happen to you” if VOM continues to share the Gospel via weekly fax transmissions. The great news is Voice of the Martyrs has been active in North Korea for decades, including launching tens of thousands of “Scripture Balloons,” helium filled balloons that are printed with Scripture passages and other gospel messages. Today’s Concentration Camps That The World Ignores – Why God? Kenneth Bae was a man who found himself locked up in a North Korean prison. 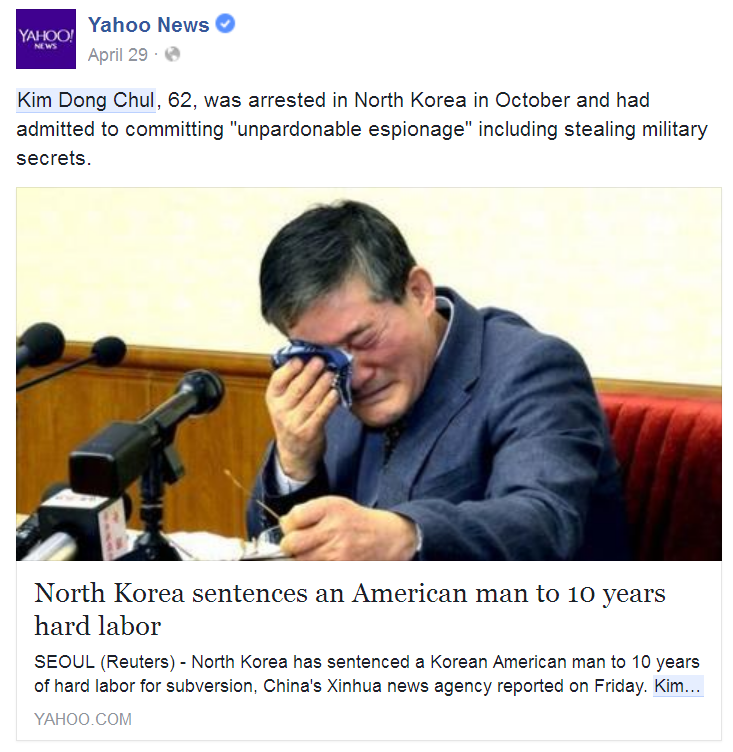 He was a U.S. missionary was sentenced to fifteen years of hard labor in North Korea, and served in a labor camp for two years before ultimately being freed. Today he is speaking out about his experience in the prison camp and how PRAYER was a powerful tool from the Lord that got him through the hard prison camp. Who is Kenneth Bae? And why was he held by North Korea? Kenneth Bae was born in South Korea, and immigrated at age 16 to the United States with his parents. He lived in Lynwood, Washington, before moving to China in 2005, and about a year later, he established “Nations Tour,” a China-based tour company that specialized in tours of North Korea. Many of his trips to North Korea were never an issue, until during a tour in November 2012, Bae was taken into custody and was accused of attempting to overthrow the government. He was arrested not far from the city of Yanji, where some Christian groups provide aid to North Korean refugees. Bae said that what got him in trouble was a computer hard drive that he possessed that contained prayers to God. In addition he had photographs of impoverished North Korean children. It also contained a video of emaciated North Korean children scrounging in the dirt for food. The footage wasn’t Bae’s but rather a friends footage which was sent to him years earlier. Officials accused him of being a spy and placed him on trial. According to the Washington Times, after the banned material was discovered, he was held in seclusion in a hotel in northeastern North Korea for a month while officials grilled him. 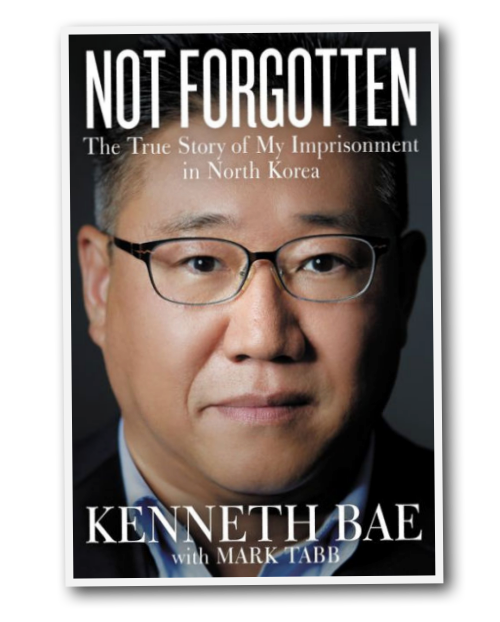 In his new book, Not Forgotten,he describes how he was given a few bites of rice and some wilted vegetables, and was forced to watch government propaganda most evening. He was not beaten or overtly physically abused by authorities. He eventually confessed that one of the documents on his hard drive was an effort to bring tourists into North Korea to pray and spread the love of God. He had hoped that the “walls” isolating North Koreans from the rest of the world would come crumbling down. Bae struggled to explain that he wasn’t trying to actually overthrow the government, but he was sentenced anyways to 15 years hard labor. “They (the prosecutors) said, ‘You attempted to overthrow the government through prayer and worship’ and they really took prayer as a weapon against them,” Kenneth Bae told CBS News this past week. Not Forgotten is a modern story of intrigue, suspense, and heart. From the first harrowing moments of his ordeal to his release—and even today—Ken never wavers in his love for the North Korean people, even his captors. Not Forgotten is a modern testament of a missionary forced to rely solely on the God who sent him into dangerous territory. Readers will marvel at the rare, firsthand tour of life inside the most shrouded country on the planet, meeting its people, experiencing their daily lives, taking in the landscape, and encountering the tyranny of a totalitarian regime. With its combined spiritual and secular appeal, this never-before-told story is sure to captivate and inspire readers of all ages. In a few of the interviews he recalled that the labor was hard, and that he spent many long hours in the fields. It was that belief that ultimately brought him through the prison camp. He realized that he had a new mission: to remind the world not to forget the ordinary people who are suffering in North Korea. Bae told CNN that he spent his days “depending on God and pretty much living day to day—just one day at a time.” He trusted that God would be his rescuer, and held onto the promises of Scripture. The missionary was ultimately pardoned by Kim Jong Un 735 days after his arrest. “I was just there to love the people, let people know that God cares about them and the rest of the world cares about them,” Bae explained. In November 2014, the U.S. State Department announced it secured the release of Bae and Miller. Another American, Fowle, was also released in October 2014. Jeffrey Fowle, an Ohio man who spent five months in detention in North Korea. Authorities took Fowle into custody after he left a Bible at a club in the northern part of the country. He urges the Body of Christ not to forget about North Korean Christians in their suffering. University of Virginia student Otto F. Warmbier was sentenced to 15 years of hard labor in March 2016 for trying to steal a political banner with a government slogan on it. Remember to pray for him. 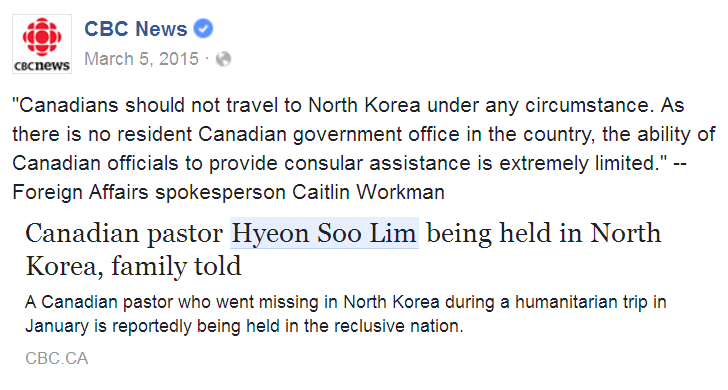 A Canadian Pastor -Hyeon Soo Lim has been held by North Korea according to Reuters. A North Korean court has sentenced him to prison for life at hard labor. Although born in South Korea, Lim has lived in Canada since 1986 and is a Canadian citizen. He is the pastor of one of Canada’s largest churches, the Light Korean Presbyterian Church in Toronto. At a July news conference in North Korea, Lim confessed that he had traveled to the country on a humanitarian mission and gathered information that he used in sermons outside the country to drive the regime to a collapse “with the love of God” according to The U.K. Telegraph. The court found Lim guilty of overthrowing the government and undermining its social system with “religious activities” he conducted over a period of 18 years, China’s Xinhua reported. The pastor had traveled to North Korea more than 100 times since 1997, helping to establish an orphanage and a nursing home there. According to the Huffington Post, Hyeon Soo Lim says he spends eight hours a day, six days a week, toiling in a labour camp, with no contact with the outside world. The pastor says it took him time to adjust to the work but he now tells himself the exercise is good for his health. Lim, who is in his 60s, says he is desperate to hear from his family and has only been able to send them one letter so far. He also says he has requested a Bible from North Korean authorities. May 5 ·PRAYER REQUEST: Pastor Han’s mangled body was found on the side of a mountain. “There were multiple knife wounds on his stomach from repeated stabbings, and his head had been chopped by an axe.” *Join us in praying for his wife and two children. Recently, Pastor Han, pastor of a church in Chiangbai, China was brutally murdered by North Korean secret agents, sources revealed that he was hacked to death. The purpose behind the murder was to provide a “warning” to Christians in China, who actively assisted North Korean refugees.